The eighth Permaculture Design principle is ‘Accelerating Succession and Evolution’ – Using and accelerating natural plant succession to establish favourable sites and soils. An empty field left undisturbed for long enough will inevitably turn into a forest, given enough time. Nature will fill empty, barren or disturbed ground with plants which quickly stabilise and build the soil, to prepare the ground for progressively larger plants, until the area is filled with trees, and many layers of understory plants beneath them. This process is called Forest Succession, and with this design principle, we aim to assist Nature’s efforts to accelerate this process, so instead of waiting 50-150 years for a forest to develop for example, we can assist in the effort and create a climax forest in around 10 years instead. Why forests? Because forest systems are one of the most productive and most sustainable systems known, it is what Nature creates at almost every opportunity. Forest systems can be designed to produce food if we construct them using edible plant species, and they can produce other useful resources such as timber, fibres, dyes and medicines. In addition, what makes them special is that they are living ecosystems, and therefore support great biodiversity, they provide a home to a wide range of flora and fauna, which all comes together to create a balanced, natural, pest and weed free system. Before we look deeper into the principle of accelerating forest succession, it is important to define what forest succession actually is and how it operates. When any soil is laid bare or disturbed, Nature has a system for repairing the degraded ground in order to prevent soil erosion and to reconstruct the ecosystem which was there or should be there. Plants with deep tap roots drill into hardpan to decompact it, creating channels to allow water and air back in the soil. Plants with fine, net-like root structures hold the soil together and prevent erosion on slopes and banks. Plants with thorns or which are poisonous protect the ground cover plants from being over-grazed by herbivores. We are all familiar with these amazing pioneer plants, we commonly call them weeds! Weeds are by definition “plants growing where we don’t want them to” and that is not a biological or ecological categorisation, it’s just a unscientific value judgement of the worth and place of certain plants in the ecosystem according to subjective human opinion. The pioneer plant’s action of stabilising any soil disturbance or damage is only the first of many steps of a full-blown reconstruction process which Nature carries out. If an abandoned field is left there long enough, Nature will, over time, transform it into a forest. This process I am describing is called ecological succession. Ecological succession is the orderly and predictable process by which an ecological community progressively transforms itself to ultimately create a stable system. This process is initiated whenever new space is made available for Nature to work upon. This can either be new space created by a landslide or deposition of lava, or existing space created through the disturbance of an existing ecosystem through factors such as logging and clear-felling, fires, grazing of livestock and so forth. Where no soil is present in the first instance, the process is termed primary succession, and in cases where soil is already present, the process is secondary succession. We can also observe that forests go through the same succession process, which is termed forest succession, where any ground that is disturbed or made bare is transformed progressively by Nature to create a living ecosystem, such as a forest. Pioneer plants first populate disturbed soil. These plants are annuals that spread by producing a large amount of seeds that are carried by the wind, allowing them to be carried far and wide. They have special adaptations that make them ideal for their pioneering function. They can grow in hot, dry and exposed conditions, and in very poor soil. They have special adaptations such as deep tap roots which break up compacted soil, extensive networks of fibrous roots which hold loose soil together, roots with nodes which contain nitrogen fixing bacteria which add nitrogen to the soil or they can employ thorns or contain substances toxic to herbivores to protect themselves from being eaten. These plants are short lived, and die down, improving the soil, and creating a leaf litter mulch which breaks down and starts the process of soil building. This pioneer plants create an environment which can support perennial plants and grasses, which then start inhabiting this space. Many perennials have their own special adaptations and survival mechanisms which allow them to transform what the pioneer plants have left behind into a grassy meadow. Shade intolerant tree seedlings also begin growing in this space. Once these changes have taken place, the space becomes suitable for the growth of woody pioneers or shrubs. The transformation into a shrubland elevates the height of the vegetation, and creates a protective microclimate which supports the growth of other small trees. Fast growing small, short-lived pioneer trees form a thicket which transforms the area into a young forest. The short-lived pioneer trees are gradually replaced by taller and longer lived hardwoods trees – the climax trees, and an understory of shade tolerant species grows below them, creating a mature forest. Once this system is established, it doesn’t remain static, nothing in Nature does — it’s a living, dynamic system. As plants naturally die down, they are replaced by others, and if a large space results from the loss of a large tree for example, a small cycle can occur in that space to repopulate it. If any disturbance occurs at any point in the process, this pushes the process of forest succession back a step in the localised area of the disturbance, and it continues forward from that point onwards. At this point, you may be wondering what’s the relevance of forest succession in regards to agriculture and food production, why is it so important that there is a whole design principle centred around it? Well, consider this. 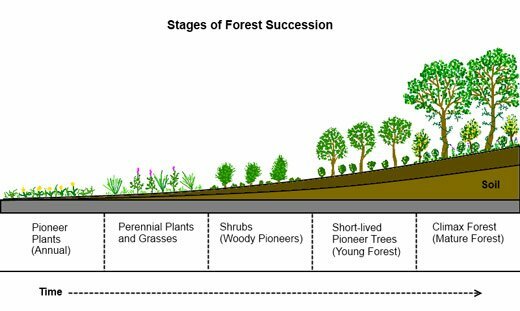 Conventional agricultural systems try to keep the the ground at the weed stage (annual plant stage) of forest succession by expending (wasting!) huge amount of energy in an attempt to try to reverse Nature’s processes. The digging, weeding, spraying and clearing never ends in an attempt to arrest the natural process of forest succession. Nature is a solar powered plant growing system, it has literally an infinite energy amount of energy to draw upon, the sun! To counteract Nature’s efforts, conventional agriculture is burning up the planet’s finite non-renewable and highly polluting fossil fuels. This mindset is competitive against Nature. Not very energy-efficient, sustainable, or intelligent, is it? Instead of trying to fight Nature and pulling in the opposite direction to the natural flow in a futile tug of war, we can instead push in the same direction together and get to the same destination faster – a mature forest. This is precisely what we do, and this is what this principle describes, working with Nature rather than against it, using our energy to complement Nature’s efforts, so that Nature works for us, and we work for Nature, in a collaborative fashion. Normally, forests take a long time to establish themselves as they go through the successive stages of forest progression to reach the final climax forest stage. 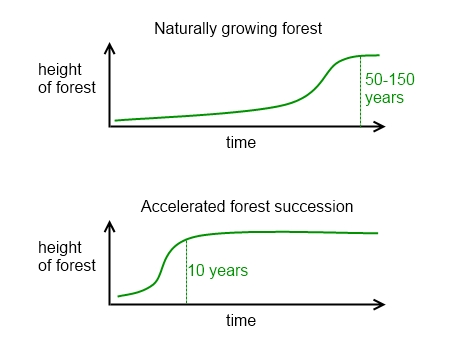 The height of the forest increases quite slowly at the earlier stages, and then shoots up at a faster rate once trees become established and start growing to the maximum canopy height, as shown in the diagram below. By planting in all the layers of a forest at the same time, we can instantly create the multi-tiered structure and we don’t have to wait for each step to complete before the next one can commence. This way, we can speed up the process of forest succession immensely, and create an established forest in no time at all. There are a variety of ways that we can accelerate the forest succession process and assist Nature to establish a forest system quicker than would naturally happen. If the ground has been cleared, then Nature would have already filled it with pioneer plants, what are commonly termed ‘weeds’. Most weeds are annuals and can be slashed and used as mulch before they produce seed. This will interrupt their reproductive cycle and they will not regrow. Their role in nature is to stabilise the soil, accumulate minerals, and build rich soil when they die down, so they are an ideal material for a nutrient-rich soil building mulch to use around plants. They can also be covered with newspaper or cardboard to kill them off, where they will rot down and add nutrients back into the soil. Perennial weeds regrow from their roots if cut above the ground and need to be dug out if you want to get rid of them quickly, but be aware if too much of the soil disturbance occurs, many annual weed seeds that are dormant in the soil will germinate and populate the disturbed area with annuals once again. Perennial weeds will eventually be shaded out by the forest plants and die off on their own in the long term, this is part of the natural cycle of forest succession. Woody perennial weeds are also a very good source of soil building material as the woody plant tissues contain the compound lignin, which decomposes to form the major constituent of humus which is the organic part of the soil. Where adverse conditions make it harder to establish a forest all at once, we can begin by planting tough, hardy annuals and perennials that will easily survive these conditions. Once they establish themselves, increase the fertility of the soil, and create supportive microclimates, they will provide a more favourable environment which will better support the climax forest species that will be planted there later and increase their survival chances considerably. As practical examples, we can plant drought-tolerant windbreak plants in hot, windy areas, and then grow the other plants in the cover they provide. In areas with salinity problems, we can plant deep-rooted salt-tolerant perennial plants and trees to lower the water table and remediate the salinity problem, so the soil can support salt-sensitive plant species. If the soil is depleted, we can use nitrogen fixing plants, green manures and mulches to add fertility to the soil, then we can grow plants that have higher nutrient demands. If the soil is not very deep, or it if is badly degraded, plants do not grow as well as they could, and this makes it so much more difficult to establish a forest system under such conditions. Nature builds soil very slowly, and may not be able to rebuild the soil if the the environment is damaged beyond repair, so rather waiting for the soil to build naturally, which takes decades, or may possibly never happen, we can speed up the process by adding more organic matter to the soil, by using mulch, compost, green manures (plants grown then cut and dug into the soil before they go to seed) or natural fertilisers such as manure, seaweed, worm castings, etc. By building the soil through the addition of organic matter, we increase the levels of nutrients available to plants, increase moisture retention in dry soils, help break up clay soils and generally improve the soil so it can better support plants. With the improved soil conditions, we can then establish a forest system more quickly, or if the conditions are still very harsh, then the soil improvements will allow us to establish a few hardy plants, which will then create more supportive conditions for the plants that follow, as discussed in the previous point. Nature uses whatever plant species are at hand, available in a specific location, to create a forest system with. These naturally occurring plants are utilised in each step of forest succession, from pioneer plants all the way through to climax trees. We can choose the species that are useful to us and use them in the place of the naturally occurring ones, so that way we are able to produce a yield as the forest system establishes itself, and at the same time assist Nature if creating a living ecosystem, a true mutually beneficial win-win situation. This is the technique we use to develop food forests – these are forest systems where we create each forest layer using edible or supporting plant species of our own choosing. They are highly productive intensive food production system that have all the benefits of natural forests – they are pest and weed free, don’t require digging, are self-mulching and take little work to maintain. Most importantly, they are living ecosystem which support a biodiverse range of life forms, such as birds, animals, reptiles, amphibians, insects and plants. In summary, the ecological process of forest succession takes many decades to create a forest system unaided, but we can collaborate with Nature to speed up the process and establish a forest system in less than a decade. We can help to create favourable conditions for plant growth by using the existing local or external resources to improve the soil, by creating a nucleus of hardy plants to build a supportive microclimate, and by choosing the forest succession species that are useful to us which to support the growth of a forest system. Hi Angelo, once again I love your work! I am in the very early stages of creating my own food forest. This information helps me to reinforce my thinking in how best to go about it. I also have the food forest DVD by Geoff Lawton which you would know of. Great to see you continuing your permaculture work 4 years on from our pdc in 08! Cheers Mike Kwan gold coast. The principles are very important in design, so I’m presenting them in both a theoretical and applied perspective so people can understand how they work on a practical level. Best of luck with the food forest project up on the Gold Coast, tropical food forests grow so quickly, you’ll have something quite established in no time with your climate. Great to hear other classmates are still active too! PS – Geoff Lawton’s foof forest DVD is excellent, I thoroughly recommend it, as I do all his other instructional DVDs he has produced! This is an awesome article. I wonder how you would apply these principles in the following situation. I own 50 hectares of forest in the Netherlands on poor, sandy, dry soil. It was all heath until 1920, then plantation of mostly pine until circa 1970, then we slowly diversified it in terms of species and age by selective logging and a little bit of planting. We’ve got one major pest, which is American black cherry. Over here it grows not as a pretty tree with good wood, but as a shrub. When left alone, it will outgrow and overshadow all local species, particularly pine. Fighting the cherry under a closed canopy of deep-shade trees is very manageable. However, the transition from pine plantation to shady standard forest is only halfway on average, and just beginning in certain spots. Under pines, the fight is much harder to keep up. The best window of opportunity to intervene in a more permacultural way seems to be after logging. Most trees are felled selectively, but there are always a few spots where too many tries have been taken away (often due to diseases). That’s where cherry spreads most strongly. The loggers already leave as much debris as possible to keep the soil moist and shadowed and to leach nutrients. Some spots respond just fine: thickets of birch and pine will sprout in the first spring after logging, and with a little attention those sites are home safe. It’s the driest spots, where this response is weak or absent, and black cherry will seize day, usally after a year or two. So my guess is, there ought to be cheap-to-buy, easy-to-sow annual plants that will do a bit of pioneering in these toughest patches: creating shadow, retaining moisture, adding nutrients when they die off. But which? Maybe that was a little overwhelming. I basically just have the one question: there ought to be cheap-to-buy, easy-to-sow annual plants that will do a bit of pioneering in dry clear-felled areas in plantation forest on poor soil. Any tips on which seeds to look out for? You cannot drive forest succession backwards. You are well past the annual stage, annuals will not choke out shrubs. If the American black cherry is populating very dry spots that have proven unfavourable to other trees, then you are clearly at the ‘shrub’ stage of succession, and Nature is trying to use this species to improve those dry areas. If you want to intensively manage these areas, you can grow any kind of nitrogen fixing/leguminous plants, green manures or cover crops to improve the soil so it can support our target species, but you’ll need to weed it the cherry trees while this is happening. Since you are at the shrub stage of forest succession, where the cherry is the ‘shrub’ that is taking over, ideally, you need to find another useful shrub that will occupy the same ecological niche, and displace the cherry. The idea behind forest succession design is we do what nature will do anyway, but we choose the species that we want, and we speed the process along by helping it progress. Do any short lived trees or shrubs that can tolerate dry, poor soil that grow in your climate? That would be the ideal thing to plant in those areas. Also, with the cherries, if you rip them up regularly while they are young and use them as mulch in the areas they are trying to grow in, this should help improve the soil there. Thanks for your thoughtful reply. What a powerful concept (implied) that you can have a forest which is not actually at the forest stage of succession, but at the annuals stage or (in our case) the shrub stage. Taking your advice, I will be looking out for shrubs that do grow and sow easily on poor soil, like black cherry, but that don’t grow beyond one or two meters, and don’t shade out the soil as fully as black cherry does. My first thought is broom, since it is a typical pioneering shrub for poor dry soil and a nitrogen fixer (and native to the area). Also we have a patch of garden-escaped Oregon grape in a corner of our forest. It’s not a native, but it does seem to stay below about one meter, and we’ve seen trees set seed and grow up below / in between it. I’m am very excited to be teaching our first intro to permiculture class at Angelic Organics Learning Center this weekend. I have found your website to be very useful and informative.